Using a series of sculptural reverb plates, one feeding into the next, A THIN WALL SYMPATHETICALLY MAINTAINED is a loop of detached enmeshment. 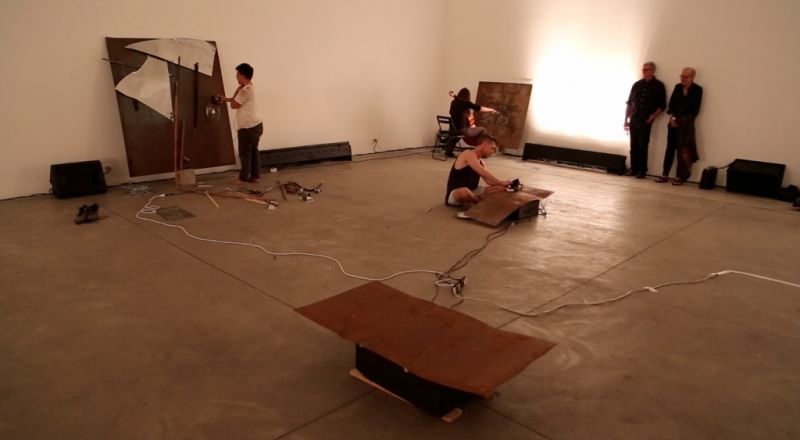 Bodies and sound are pushed through and are stopped by metal walls, as each performer confronts their own composed framing. Sounds are stimulated through the presence of the plate and then amplified through the next plate of the series. Each performer must contend with these physical and sonic ghostings simultaneous to their own expressions. Photos by Barnett Cohen and Nora Beckman.